It's cutting it close, but I could do it. I was already on the road for other signings, and about 20 minutes from the title office, so I swung by, picked up docs, and then decided to pass on lunch in Phoenix, so I could eat at a local coffee shop I know in Maricopa. That would give me about 30 minutes for lunch and cushion for traffic. All was going great, until minute 32 of the 54 minute drive. Then I heard it. Just the softest of dings, and the subtlest of changes in the way my car handled. At 75 miles an hour (sure, that's the speed limit), in the fast lane on Interstate 10, I got a flat tire. I quickly had to slow down and make my way to the far right median without getting killed along the way. Even with hazard lights on, freeway traffic can be unforgiving. Luckily I made it across all lanes, but the placement was precarious. The on-ramp from another major freeway was just behind me, which kept traffic constant, and moving at quite a clip. I needed to change this tire fast! I jumped out of the car, in 117 degree heat, and popped the trunk. My relief at cleaning out my trunk two days before was short lived. As I lifted the spare-tire compartment lid (is that what you call it? ), it was obvious there was actually no spare tire. When did that happen? I jumped back in my car and starting thinking about options. First, do I call in reinforcements to meet me for the documents and head off to Maricopa to do the signing for me? That didn't seem to make sense. I knew this customer needed something to go right...right now. I knew I had to get the car to a safe place, and to get repaired. This signing was not my last of the day. I jumped onto the GEICO Insurance smartphone app and reported my incident for immediate roadside assistance. The local company I use to do all my oil changes and car maintenance, Community Tire and Auto Care (Thanks Pat, Howard and the whole team!) happened to have a location within a mile, so I chose that for the vehicle tow location. Roadside Asisstance comes with my insurance policy, and has saved me more than this one time. The problem was, the tow truck would not get there for another hour, which would be 1:15. Not going to work for a 1:00pm signing. It was becoming clear that no matter what happened, I was likely to be late. Knowing this, I called the real estate agent that was my contact on this signing and I let her know what happened. She was a little upset, not at me or the situation, but more like in awe of all the things that continued to go wrong with this particular transaction. She had a laundry list of errors and weird circumstances that led to this 30 day late close of escrow. I told her that I didn't know exactly what was going to happen, but I was on it, and we should convey to her client that I would be 30 minutes late, so expect me at 1:30pm. All I had to do now was find a way to make that happen. I called the towing company and asked them two questions. First, could I get bumped up the priority and picked up faster (to which the answer was no-polite, but no). And second, do I have to be with the car when the tow truck gets there? I am happy to say the answer to this question was "no" as well. I did not have to be there when the tow truck arrived, so I needed to figure out how to get myself off the freeway and to another vehicle and fast. I was near the airport, so I thought about ordering a rental car. That seemed expensive and a hassle, but on the list of possibilities, nonetheless. Then, I thought about using Turo, the app that allows people to rent cars direct from every day vehicle owners (like AirBNB, but for cars). Still, this didn't seem viable considering the time crunch. Instead, I started thinking about friends and family that may work or live in the area. Who would lend me a car for a few hours? That seemed ridiculous, but as names started coming to me, I realized that some of my closest circle of friends weren't far away. The first person I called, worked at a hospital 4 miles away. He was available, and was happy to lend me his car, as long as I could be back by 3. Great...schedules were going so well as it was. But, I knew I could make it happen! I thanked him and ordered a Lyft. That's right, I ordered a Lyft to pick me up on the freeway. And, believe it or not, their GPS was so accurate, the driver knew exactly where to pick me up, behind the white Chevy Malibu. He called, just to be sure, but he was there in less than 6 minutes (Thanks Alfredo!). After a quick ride over to the hospital to pick up my friends car, I was back on the road, and according to GPS, would arrive at the client's location by 1:16. I conveyed this to the real estate agent, and she was ecstatic, to say the least. She, and the borrowers, were so grateful, and thoughtful (offering lots of water and food), and the signing was still done by 1:55pm. On top of that, I was able to get my friend's car back to him earlier than needed, and I talked him into giving me a ride all the way back up to north Phoenix so I could have those documents back on the Escrow Officer's desk by 3:15 for a same-day close. There were a few things about this scenario that helped it become a success. 1. Tackle challenges with an attitude to conquer, not complain. If you want some good, dramatic stories that really highlight all the reasons you have to complain about stuff, this business has PLENTY of fodder. Choose differently. 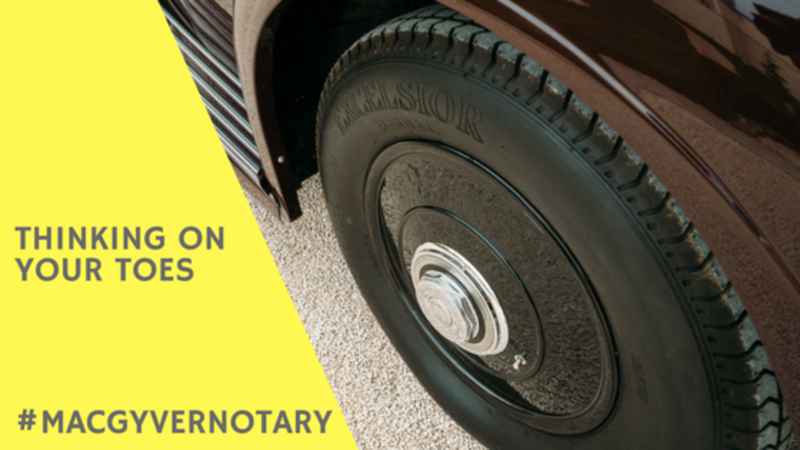 Be the "Macgyver" notary and find the way "out". 2. Your reslience, and ability to bounce back when the sh%t hits the fan, is a key indicator of success. Stop, breathe, and think. My client trusted me to get a rush signing done. I knew exactly where I wanted my car to be towed, because I have a trusted relationship, and loyalty toward, my shop. 4. Communication is key. Lots can happen in your day to day business. Most people are pretty cool when you communicate, and give plenty of notice. 5. Be prepared! Have a spare tire (unlike me), and get roadside assistance, even if you pay separate from your insurance (like AAA, etc). It would also help you to set up an Uber or a Lyft account ahead of time, so you are not scrambling in a crisis to do so. 6. Build in a time cushion for werid stuff to happen. You never know when coffee is going to spill, freeways close down, printers go on the fritz, or tires go flat. If you have some time to kill before an appointment, consider killing that time a little closer to your appointment location-not at home. Shop, read, explore, bank, whatever you do, somewhere new. It might be the one action that saves your commitment to integrity one day.